The Clarence DeMar Marathon was established in 1978 to honor former Keene resident Clarence DeMar. The marathon has operated consecutively for 38 years. We currently offer two competitive races, a Full Marathon and Half Marathon, and two community wellness programs: the DeMar Kids Marathon and DeMar Super Senior Marathon. 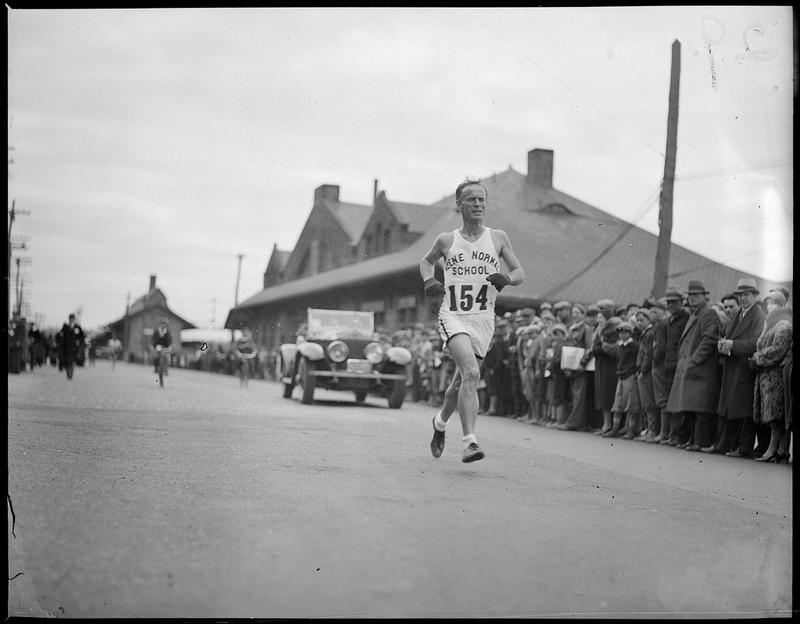 Clarence DeMar comes in eighteenth in 1932 marathon. Clarence DeMar was born into an impoverished childhood. He overcame health troubles, hardship, and World War I to become a seven-time B.A.A. Boston Marathon champion, an Olympic medalist, and an international running icon. No one has ever broken his record number of Boston wins. We are inspired by Clarence DeMar’s pure love of the sport, his stature in the distance running community, and his particularly New England character—stern, principled, humble, and wry. At the DeMar Marathon, we follow his example. Anyone who wants to run can run. We’ll make sure you have an world-class experience. All you have to do is start. Here’s how Clarence DeMar did. Clarence DeMar ran every day of his life. He ran to work. He ran on weekends. He ran 110 miles to get to a 10-mile race. He ran to get milk and bread. But he didn’t start out a runner—far from it. He ran because he discovered the truth: Running brought him joy. Born in 1888, DeMar grew up poor in a little town north of Cincinnati, OH. He was 10 when his father died. His mother moved the family of six kids to Massachusetts, and sent DeMar to a school for orphans in Boston Harbor. He hated the school, later calling it “a hard and somewhat squelched life.” Yet he was was bright and independent, and eventually earned a spot at the University of Vermont. He had no aptitude for football, baseball, or boxing, so he started cross-country running. In 1910, DeMar decided to run the Boston Marathon. He came in second. A few months later, his doctor detected a murmur in DeMar’s heart. Two hours, 21 minutes, 39 seconds later, Clarence DeMar won. “I’ve often wondered if that doctor wasn’t listening to his own heart by mistake,” he said. 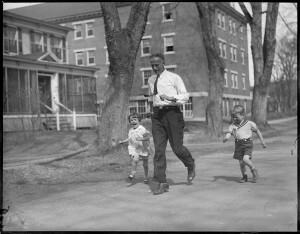 After several years away from marathoning, DeMar ran the 1917 Boston Marathon (he came in third). When he returned from serving in the Army during World War I, he kept racing. He won the Boston Marathon in 1922. And in 1923. And in 1924. And from 1926 through 1928. The press called him DeMarvelous and Mr. DeMarathon. In addition to his Boston streak, he won a bronze medal in marathoning at the French 1924 Summer Olympics. No other American won an Olympic marathon medal until 1976. Spectators cheered for him wildly along his many routes. He was like Charles Lindbergh without the wings. But the truth was, DeMar hated the noise and attention. Once in Boston, he punched a drunken spectator who jumped out to shake his hand. At another race, a driver grazed the heels of a fellow runner. DeMar memorized the driver’s license plate number and reported her to the police. DeMar won his last Boston in 1930 at the age of 41. His record of seven wins has never been broken, and he remains the oldest winner of the event ever. He lived in Keene by then, and taught in the Industrial Engineering department at the Keene Normal School, now called Keene State College. He trained the school’s cross-country team on a cinder track not far from today’s DeMar Marathon finish line. He was a legend. His running buddies called him Old Man DeMar. He was 69 when he ran his last race, a 15k in 1958. He came in 14th. Clarence DeMar died of stomach cancer not long after. A day or so before his death, he left his sickbed and headed for the door. In DeMar’s honor, we create for you this marathon filled with beauty, challenge, and joy. We’ll never give up. There’s a brand new book about Clarence DeMar! Long before the days of running apps, designer running shoes and online marathon training programs, three-time Olympian Clarence DeMar self-coached his way to seven Boston Marathon victories- a record that remains unbroken today. 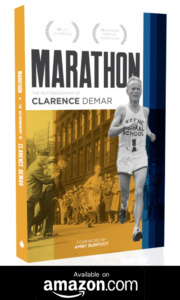 More than one hundred years since winning his first marathon, Clarence “DeMarathon” DeMar is still known as one of the greatest American distance runners of all time. Marathon, DeMar’s 1937 memoir, is a simple and honest reflection of the life of this working-class family man who experienced national fame during the depression era. A student of his sport and an athlete far ahead of his time, DeMar would average 100 miles per week while closely monitoring his body’s response to nutritional changes. Among the first elite athletes to experiment with vegetarian and alkaline-based diets, DeMar shares his experience-based perspective on nutrition, sleep, mileage and even foot-strike- topics that are still heavily debated in the running community today. The fashion and technology surrounding the sport may certainly have changed over the years, but the feat of running 26.2 miles has remained. Perhaps this is why modern day runners find DeMar’s Marathon memoir to be as pertinent and informative today as it was in 1937.